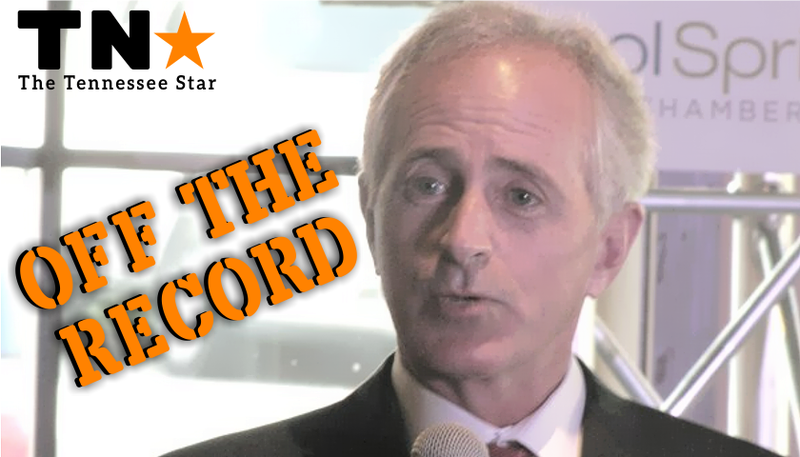 In typical Corker fashion, he throws out a bone to conservatives in the crowd because he thinks they haven’t yet figured out that he is not a conservative. What conservatives in Tennessee do know is that when Corker first went to D.C. in 2007, he was openly against illegal immigration (not to confuse illegal immigration with refugee resettlement which is legal immigration). He was so against it that he said, that to be “fair to American citizens,” illegal aliens should have to leave and then re-enter before they could apply to be here legally…..
Then after spending too many years in Washington, he supported the 2013 “Gang of Eight” illegal immigration amnesty bill. The fact is though that it’s very problematic for states like Tennessee. What happens is we have NGOs, non-government organizations that have set up here in the state and Catholic Charities may be involved. So what happens is you have an intake program that takes place and again they’re directed to places all around the country without governors’ approval and so I understand why governors would have concerns with that. As far as the lawsuit itself I don’t know what the details are. Obviously I know Mr. Slatery well and I know, I think, he decided not to take it up but the General Assembly did. When I was Commissioner of Finance, Fred Thompson and Bill Frist did a really good job of staying out of my issues. The mayor of Chattanooga is there now and I stay out of his issues and I’m gonna let the General Assembly deal with this issue. Bob seems pretty fuzzy on important details of what’s happening with this program in his home state – like really, he’s not sure whether Catholic Charities is involved in operating refugee resettlement in Tennessee???? Maybe he’s just been in Washington too long. Who knew that champion of ISIS has a friend in Nashville? Apparently it was also discovered that Elibiary may have used his security clearance to improperly access “for official use only” Texas Department of Public Safety reports. It was alleged that he tried to pass these documents to a media outlet to get a story on the scourge of Islamophobia. Reading ISIS’s latest mag ‘otherizing’ Egypt’s Copts. Subhanallah how what goes around comes around. Coptic ldrs did same to MB Egyptians. Former Texan and now Nashville resident, convert Paul Iesa Galloway and Mohamed Elibiary go way back. Galloway used to be the director of the CAIR-Houston office before becoming the director of Tennessee’s American Muslim Advisory Council (AMAC) and registered to lobby legislators in the Tennessee General Assembly. Elibiary was a CAIR official in their Dallas-Forth Worth office. While Galloway was living in Texas, he served as an executive officer of Elibiary’s Freedom & Justice Foundation and was the PR director for Elibiary’s Texas security company Lonestar Intelligence, LLC. Senator Corker was never a conservative. He needs to be “retired” when he is up for re-election. He is a smooth talker but does not represent the best interest of Tennessee nor of America. He would have been called a Democrat when Reagan was President. I’d like to see Tim Burchett represent us in DC. If I could replace Lamar Alexander with Tim Burchett I would have replaced a mule with an elephant. Tim is conservative through and though. Lamar apparently started out his political career as a conservative but has now taken more left turns than a Nascar driver. Senator Corker is just like too many other US GOP Senators who were conveniently conservatives to be elected and quickly abandoned conservative principles in the Senate. They jointly work to oppose true conservative candidates supported by the Senate Conservative Fund. When the conservative candidate wins the state primary he/she is often not supported in the general election by these RINO establishment senators. Look as recently as the last election in CO and loss by the excellent conservative Senate GOP candidate for proof. A little more money and support from them would have helped immensely. Since they stopped listening to us, why should we bother listening to or supporting them, especially Senator Corker? Indeed – spot on! Convenient Conservatives @ election time!